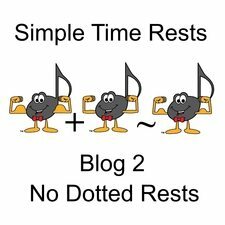 Welcome to Blog 2 in the Simple Time Rests Series - No Dotted Rests! In Blog 2, we will look at a fun way to understand why it is easiest if you do not use dotted rests in Simple Time. I have spent months trying to figure out the "rules" that would allow for the use of dotted rests in Simple Time. Quite simply, I can't find them. I cannot find any reliable source that says "You can use a dotted rest in Simple Time for the following situations:". So, quite "Simply" (haha), if you do not use dotted rests in Simple Time, you will never be wrong. Since I struggle with rules that have a list of exceptions, (like always write "i" after "e" except after "c" and a whole bunch of other exceptions), I prefer to teach rules that work with NO exceptions. In Simple Time Rests Blog 1 - Understanding the Basic Beat, we studied the Basic Beat and how to use the Basic Beat Pulses to add rests in Simple Time. If you did not read Simple Time Rests Blog 1 - Basic Beats, please Click HERE to read it now. Before looking, take a moment and see if you can list all 6 of the Simple Time Rest Rules. How did you do? Did you remember them all? Do not use dotted rests in Simple Time. That's right - No Dotted Rests in Simple Time! Every time, this creates a breakdown of "3" (a Strong-weak-weak pulse). This dotted rest pulse of 3 is only used in Compound Time. In any Simple Time, these rests are not mathematically "strong" enough to work! So, the Simple Time Rest Rules is to not use Dotted Rests. The rests in Simple Time must be grouped in order to show their S-w-M-w 4-pulse values (no matter how big or small the Basic Beat or a breakdown of this Basic Beat is!). If the term "Breakdown of the Basic Beat" is unfamiliar to you - no worries! We will review it in Blog #3 of this Series! I realize that somewhere out there, someone will find an edition of music in Simple Time that uses a dotted rest. However, this is simply because the Composer or the Editor "wrote it that way". It does NOT mean that it is correct! To add rests correctly in Simple Time, you do not use Dotted Rests! I love having fun with my students by creating unique ways to allow my students to See, Hear and Feel the musical concepts. Are you ready to have fun? Let's look at our "Ti-Do" Strong, Medium and Weak Pulse Characters as being weight lifters. How much weight can they lift (join into 1 rest) and stay balanced? Experiment #1: Can a Strong Pulse Hold on to a Weak Pulse (and use 1 rest)? When the Strong Ti-Do Pulse holds the Weak Ti-Do Pulse, he is so strong that he can hold the weak pulse and stay balanced. Therefore, the Strong Pulse can join with the Weak Pulse into 1 rest. Result: Strong Pulse + weak Pulse = 1 rest. Experiment #2: Can a Weak Pulse Hold on to a Medium Pulse (and use 1 rest)? When the Weak Ti-Do Pulse tries to hold the Medium Ti-Do Pulse, he is too weak to hold on to him and the pulse becomes unbalanced. Therefore, the Weak Pulse cannot join with the Medium Pulse into 1 rest. You must use 2 separate rests. Result: weak Pulse ~ Medium Pulse = 2 separate rests. Experiment #3: Can a Medium Pulse Hold on to a Weak Pulse (and use 1 rest)? When the Medium Ti-Do Pulse holds the Weak Ti-Do Pulse, he is still strong enough that he can hold the weak pulse and stay balanced. Therefore, the Medium Pulse can join with the Weak Pulse into 1 rest. Result: Medium Pulse + weak Pulse = 1 rest. Experiment #4: Can a Strong Pulse Hold on to a Weak Pulse and a Medium Pulse (and use 1 rest)? A dotted rest in Simple Time would involve a Strong Pulse holding on to a Weak Pulse AND a Medium Pulse. Is Strong Ti-Do "strong" enough to hold on to the Weak Ti-Do and the Medium Ti-Do and stay balanced? No, he is not! The Strong Pulse is only strong enough to hold on to the Weak Pulse into 1 rest. Then a second rest is used for the Medium Pulse. Experiment #5: Can a Weak Pulse Hold on to a Medium Pulse and a Weak Pulse (and use 1 rest)? Can a Weak Pulse holding on to a Medium Pulse AND a Weak Pulse. Is Weak Ti-Do "strong" enough to hold on to the Medium Ti-Do and the Weak Ti-Do and stay balanced? No, he is not! The first Weak Pulse will use 1 rest. Then a second rest is used to join the Medium Pulse and the second Weak Pulse into 1 rest. As our fun weight lifters have shown us, in Simple Time it is simply easier if you do not use dotted rests! PS - Remember that none of these experiments contain pulses from a whole measure of silence! That involves using a Whole Rest, which we looked at in my blog Whole Rest in 2/4 Time. In Blog 3, we will explore the Breakdown of the Basic Beat. By understanding the Breakdown Pulse, you will understand how to add rests to complete a Basic Beat. When teaching or learning music theory, a strong foundation in theory is of utmost importance! Ultimate Music Theory will provide you with this foundation. 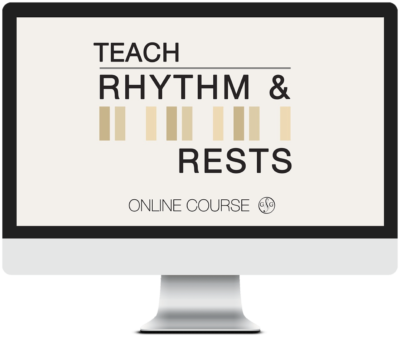 If having fun with rests has piqued your interest and curiosity, I highly recommend our online Teach Rhythm and Rests Course! It will provide you with even more information about rhythm and rests! Thank you so much, this is really a useful reminder. Hope to learn more on how and where to use dotted rests.